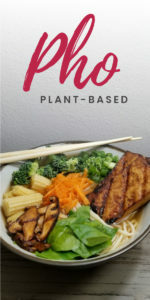 You are here: Home / Favorite Recipes / Plant-Based Pho! Are you looking to try something different for dinner soon? 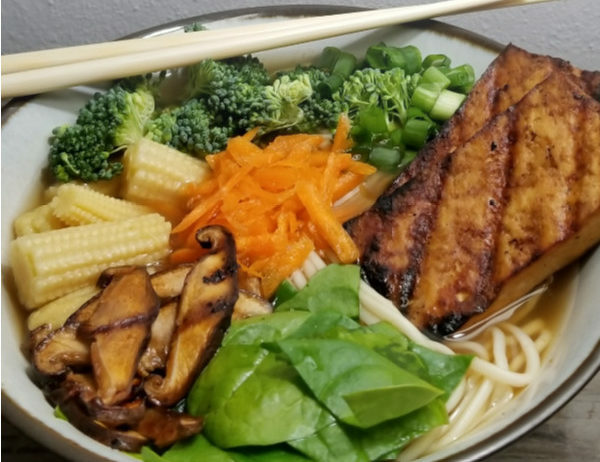 Then this plant-based Pho is for you! With a flavorful broth as the base, you choose the noodles, and toppings that sound best to you. Plus, even a novice cook can feel confident in their skills with this recipe. So step outside of your comfort zone and cook up something new this week! Add your broth, water, onion, garlic, star anise, cloves, cinnamon, and ginger to a large pot. Bring the pot to a slow boil and then turn it to simmer and let it simmer 30 minutes. After 5-10 minutes, add a bit of soy and taste. Continue to add until your satisfied with the taste. This all depends on preference, I used 1 tbsp of soy. Cook your pasta according to package directions. If no directions, boil a large pot of water and cook noodles 3-5 minutes. Once they’re al dente, drain, rinse with cold water and set aside. Prepare your toppings with your broth is simmering. Once the broth is ready, assemble your bowl. Add noodles to your bowl, ladle in broth (omitting the onion and spices), and top with your desired toppings. Enjoy!